This is a REAL steel horseshoe, crafted by a master farrier blacksmith in the heart of England. It makes the ideal housewarming gift. There are many legends surrounding the horseshoe / symbol, but the English legend is the most famous: It says that, in olde England, St Dunstan** (the original patron Saint of England) nailed a horseshoe to a horse whilst working as a blacksmith. But the horse was actually the Devil in disguise and it caused the Devil great pain. Saint Dunstan only agreed to remove the horseshoe after the Devil promised never to enter a house where a horseshoe hung. 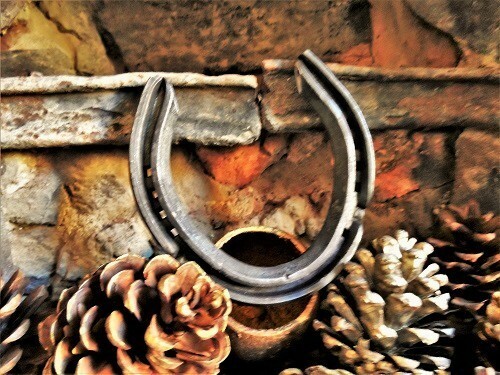 All our lucky horseshoes are handcrafted in England. Dimensions: 11.5cms high x 11.5cms wide and weighs just over 8oz (230gms). It is supplied with two nails for fixing to a wall, door, etc. The ideal gift to brighten someone's home with a bit of inspiration and some good luck wishes. Comes gift-wrapped, like all our presents - and we can print a personal message on your behalf. **Dunstan (909 -988 AD): Abbot of Glastonbury Abbey, Bishop of Worcester, Bishop of London, and Archbishop of Canterbury, later canonised as a Saint. His work restored monastic life in England and reformed the English Church. He served as an important minister to several English kings, and was the most popular saint in England for nearly two centuries, having gained fame for the many stories of his greatness, not least among which were those concerning his famed cunning in defeating the devil.